Fourth Row Center: Film Writings by Jason Bailey: On DVD: "Buffy the Vampire Slayer: Season 8 Motion Comic"
On DVD: "Buffy the Vampire Slayer: Season 8 Motion Comic"
Just so we know where everyone’s coming from, I approached the Buffy the Vampire Slayer: Season 8 Motion Comic as a Buffy fan, and a comic book know-nothing—not as a snob who doesn’t see the value of comics, but a busy guy who doesn’t make time to read them. I’d meant to check out the Buffy comics since they started rolling out back in 2007; this seemed as good a way as any to finally sample them. For those (like me) in the dark, the notion of a “motion comic” is that animators take the original artwork and elements of the comic book (or graphic novel, or whatever) and bring them to (admittedly limited) life, using snazzy camera work, moving elements, music, and voice-over dialogue to create an approximation of a cartoon. It’s not the same as watching an animated series or film, and it’s not the same as reading the comic, but it’s a fairly clever mash-up of the two experiences. The good news about the Buffy Season 8 comic series is, of course, the involvement of Buffy series creator/mastermind Joss Whedon, who has written the scripts for several of the issues, served as an “executive producer” for the entire series, and brought on other Buffy writers as well. The bad news about the motion comics is the lack of involvement from those who appeared on the other side of the camera; in spite of the fact that, charitably speaking, most of the original cast members aren’t terribly busy these days, none of them show up to resume their characterizations. It’s a tad disorienting, particularly at first (kind of like that first DTV Aladdin sequel, when suddenly Homer Simpson is doing Robin Williams’s Genie), though it is worth noting that several of the sound-alikes (Faith, Giles, and especially Xander) are awfully good sound-alikes. But as with the original series, if the strength is in the wit of the dialogue and the sly humor of the characterizations, the weakness is its occasional tendency to take its fantasy mumbo-jumbo with too much solemnity. Some of this (like the “slimy slug clan”) is might goofy, and even when the dopier devices (like Dawn’s “super-sizing”) are given appropriate ribbing, they still can’t overcome the general inanity. (For what it’s worth, no one involved seems to have the foggiest idea what the hell to do with Dawn these days.) Presumably due to time limitations, the new slayer characters never really come to life (the way the slayers-in-training did in season seven, for example), save for Satsu, whom Buffy has a fairly gratuitous (and rather cheesy) Sapphic encounter with. The most intriguing quality of the books is that they allow Whedon and his writers greater opportunity to play with structural and narrative possibilities, be it shifting point-of-views—the story of the “The Girl” in “The Chain,” for example, or the Faith-ccentric “No Future for You” series—or scrambled timelines, as in the “Time of Our Lives” series. Those experiments, which feel more organic to this format and less an attempt to replicate the television show, point the way towards this new “Buffy” becoming its own, unique entity. 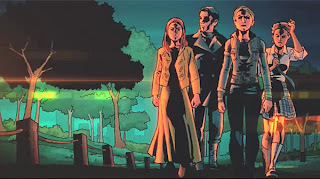 Because the Buffy the Vampire Slayer: Season 8 Motion Comic disc ends less than halfway into the “season,” the ending we’re provided is less than satisfying—a dash, rather than a period. That incompleteness, the undeniably jarring experience of hearing new voices for characters we’ve spent countless hours with, and the simple aesthetic disparities between live-action television and comic book/motion comic may very well prevent “season 8” from playing as true canon for Buffy fans. It feels more like a curio, a collection of footnotes and epilogues. Then again, there are worse ways to pass the time. 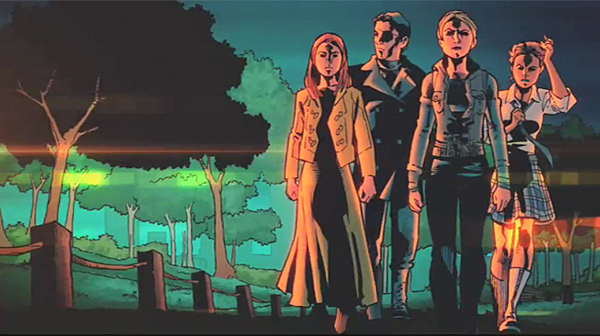 "Buffy the Vampire Slayer: Season 8 Motion Comic" is available now on DVD and Blu-ray. For full A/V and bonus feature details, read this review on DVD Talk.